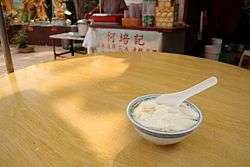 Tong sui literally translated as "sugar water", also known as tim tong, is a collective term for any sweet, warm soup or custard served as a dessert at the end of a meal in Cantonese cuisine. Tong sui are a Cantonese specialty and are rarely found in other regional cuisines of China. Outside of Cantonese-speaking communities, soupy desserts generally are not recognized as a distinct category, and the term tong sui is not used. There is a wide variety of tong sui, and in Hong Kong and Malaysia, there are often stalls which devote themselves just to selling different types of desserts. These dessert stalls have also gained prominence in overseas Chinese communities, and can be found in various parts of Canada, Australia and the United States. Black sesame soup 芝麻糊; zhīma hú Ground black sesame seeds are traditionally cooked with water and rock sugar. Chinese herbs are sometimes added to enhance the flavour and aroma. The instant black sesame powder sold in Asian supermarkets is usually sweetened. It requires the addition of hot water and mixing in the serving bowl, after which it should be left for 15 minutes before serving. Hasma 雪蛤; xuěhá A dessert made of dried fallopian tubes of the frog with supposed health benefits. Red bean paste 红豆汤; 紅豆湯; hóngdòu tāng or 红豆沙; 紅豆沙; hóngdòu shā Cooked and served exactly like mung bean soup & paste. Red bean soup is normally pre-boiled to soften the skin by leaving in hot water for one hour. Then cook in water for 20-30 minutes until the beans rupture. The adding of sugar or rock sugar is lastly added to cook for another 20-30 minutes until the bean texture becomes sandy. As for red bean paste, the skin is removed before cooking. Chinese herbs may be added to enhance the flavour and taste. Peanut paste soup 花生糊; huāshēng hú Like black sesame paste, peanut paste is a ground peanut powder cooked with syrup and water. Instant peanut paste powder sold in Asian supermarket are usually sweetened roasted peanut powder or flour, that only required to be served with hot water. Sweet potato soup 番薯糖水; fānshǔ tángshuǐ Peeled sweet potato, normally cut into smaller pieces cooked/ boiled with syrup and water. Sweet almond soup 杏仁糊; xìngrén hú Ground almond powder that cooked with sugar and water. Instant almond powder sold in Asian supermarket are usually sweetened raw almond flour or powder, requires minimal cooking with boiling water or to be served after mixing with hot water for 15 minutes. Sweet walnut soup 核桃糊; hétáo hú or 合桃糊; hé táo hú Ground walnut powder that cooked with sugar and water, sometimes milk. Similar to Sweet almond soup, instant walnut powder is sold in Asian supermarket as well. Wikimedia Commons has media related to Sugar water.